St Gabriel's Church, the parish church of North Acton. 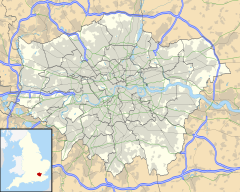 North Acton is a place in London, UK, and within the London Borough of Ealing. It is part of Acton and runs adjacent to the industrial district of Park Royal. Historically part of the Municipal Borough of Acton in the county of Middlesex, it has formed part of the London Borough of Ealing since 1965. It is primarily within the London W3 postal district, although the northern, mainly industrial part of the area is covered by NW10 and overlaps with neighbouring Park Royal, essentially as a satellite region. Park Royal, which is heavily associated with North Acton, and forms part of the same ecclesiastical parish, falls under the NW10 postcode area. Its Church of England parish church is St Gabriel's Church, North Acton. The commercial district of Park Royal overspills into North Acton, and several facilities are located on the edge of North Acton Playing Fields, including the Black Island Film Studios. North Acton is also the home to the Boden clothes brand. In recent years there has been new commercial and high-rise residential redevelopment to the south of North Acton tube station, including extensive provision of student accommodation for the University of the Arts and Imperial College London. The BBC has been associated with North Acton for many decades, with its main television rehearsal studios and its costume collection located in North Acton for many years in the late 20th century, adjacent to the railway station. There is a short and easy journey of just two stops on the Central line to reach White City and the BBC Television Centre there. Many famous actors and producers have utilised the rehearsal studios, and North Acton public house 'The Castle' opposite, where actors frequently gathered for lunch and refreshments. Following a decision by the BBC to relocate services, the rehearsal studios have closed, and the Television Centre itself also closed in 2013. The costume collection building has closed and been demolished with a new tower block of student accommodation (for the University of the Arts) opening on the site late in 2012. The student block has been named "The Costume Store" in tribute to the former BBC activity on the site. The last remaining BBC facility in North Acton today is the "BBC Park Western" studios and office block, located on Kendall Avenue, beside the Central line, midway between North Acton and West Acton tube stations. Once the headquarters of the BBC TV Outside Broadcasting Department, half the site has now been sold and redeveloped, with the remaining BBC Park Western used as the operating base, standing set, and production offices for popular television series Silent Witness, much of which is filmed around Acton and Park Royal. North Acton Playing Fields is a large open space for public recreation. Its facilities include several football and cricket pitches, multiple hard-surfaced and grass tennis courts, a basketball court, exercise machines forming a public 'outside gym', a pavilion, a children's playground, hard (tarmac) surfaced paths for walking in inclement weather, a picnic area with metal picnic tables, and designated dog-walking areas. The railway station at North Acton. The visible lines are platforms 1, 2, and 3 (one with a train) of the Central line. Beyond is a High Speed Train passing through the Network Rail (national railway) line. The main tube station is North Acton Station (Central line), although several others are within easy walking distance of the community. The Piccadilly line also passes through the parish of North Acton, although with no station stop. North Acton station is on the border of fare zones 2 and 3. It is also the location of a junction (to the west of the station) where the Central line splits between its main line and the Ealing Broadway branch. ^ Postcode area map of West London, showing North Acton tube, North Acton playing fields, and North Acton parish church, all in W3. ^ The Contact Page of North Acton parish church, showing W3 postcodes. ^ The Contact Page for North Acton tube station, showing W3 postcodes. ^ BBC comedy writer Jimmy Perry recalls rehearsals for Dad's Army at North Acton in the 1970s in this conversation with Nicolas Ridley. ^ See the University accommodation website. ^ Kingston, Alice. "Acton parks". www.ealing.gov.uk. Retrieved 7 January 2019. ^ Cited on this public attractions website. This page was last edited on 10 April 2019, at 22:44 (UTC).